Help Us Fix Bridge #31 on the NETT! 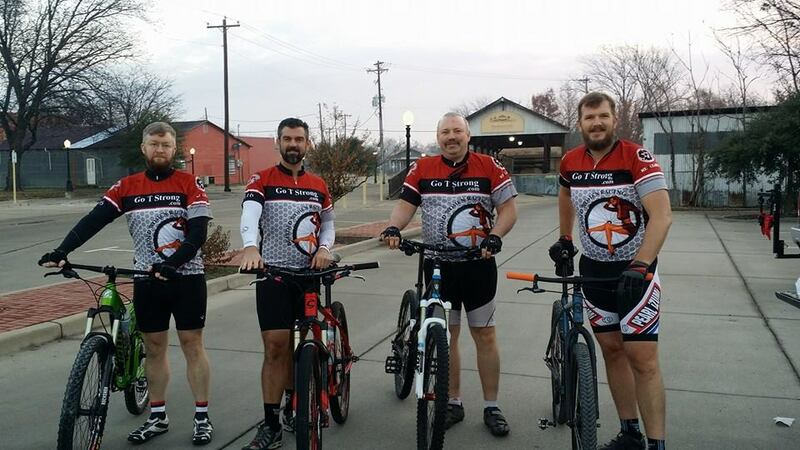 Four hardy souls left Farmersville, TX on Saturday, December 13th to ride a rare jewel in these parts of North Texas, the North East Texas Trail. After downing a couple of pastries brought on her own accord, Susie Bolton a huge NETT supporter, we headed off on the 75 mile expected journey to Paris. 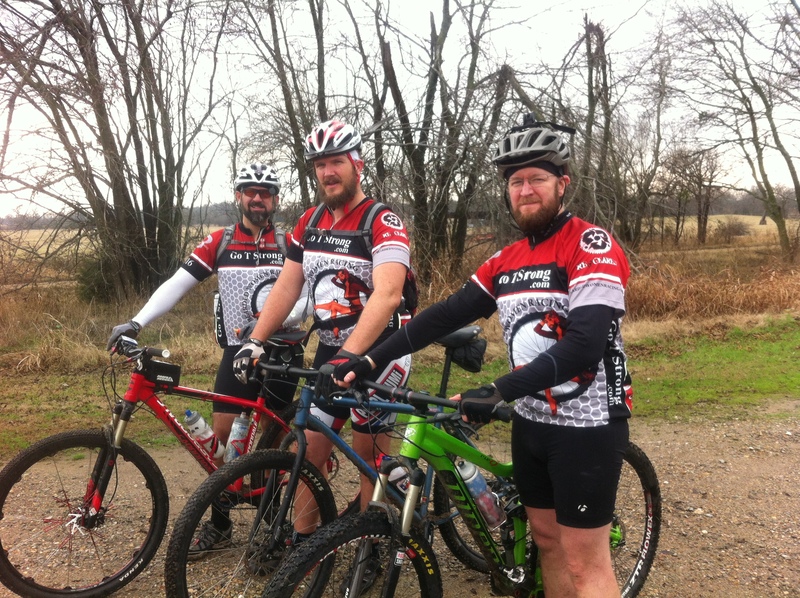 We’ve highlighted the North East Texas Trail or NETT in the past when 4 of us decided to take part in Spinistry’s first Ride the NETT event in November of 2013. Back then something about the trail ignited a passion within us for it’s beauty, wildness, and potential economic impact it can have on the communities it’s 230 miles travel through. We set a hardy 12 mile an hour pace for the first 20 – 30 miles which are very passable, locally groomed by either the city or passionate supporters and do gooders who see the positive things the trail can bring. In fact the majority of our ride from Farmersville to Pecan Gap is wide open. Unlike a city trail, the NETT offers a large, diverse wild life population. Among the highlights we saw were a family of wild boar that we flushed out , and a local hunter had passed when we told him about them. We told him bring a buddy on a mountain bike the next time and he’d be sure to be successful! Speaking of hunters, we came upon 2 of them on the trail, as it’s hunting season. I wore a brightly colored vest to lead our group for safety reasons. They were very friendly and welcoming, but be sure to approach with sensitivity as they might be in the middle of a hunt! Another wildlife highlight we encountered were two coyote’s, on different occasions, ran out into the trail ahead of us as we rode. One stayed on the trail for several yards before bolting out of our way. They were both large animals, but we felt no threat what so ever. We were told that wild boar might present issues if cornered so be cautious. Once we hit the highway just outside of Pecan Gap and crossed over to the field, we hacked through a downed tree past the open field in need of mowing. Jim Overby, self appointed SAG for our ride, met us there with some ice cold Gatorade and Fig Newtons. We felt really good and had exceeded the estimated 10 mph goal pace we had set for ourselves. We planned to stay on the entire trail as best we could. After taking a quick group pic, we left Jim and headed into the very short impassable section next to the road before it opens back up. We hacked for a couple hundred yards before Jim drove by and told us it got even worse several yards ahead, so we took his advice and got on the road to bypass that short portion. 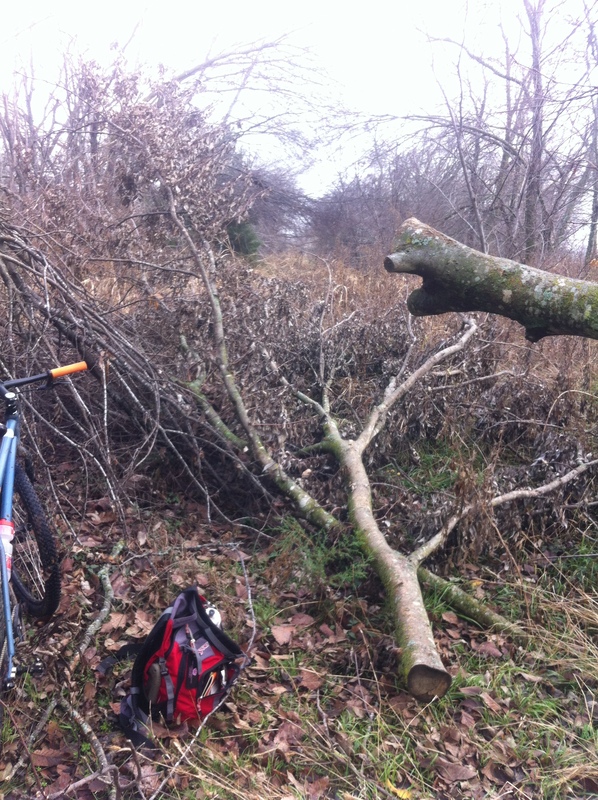 Once back on the trail, we rode it to the inevitable blocked hay bail portion of the trail. We had said to ourselves if time permitted, we’d try to hike-a-bike through this portion, however we heard the bails had been doubled up recently so we reluctantly took the bypass to Ben Franklin. One day I’ll see this section of the trail! Going around and on the county road really is boring, especially on a mountain bike. I ride a 16t SS, rigid and like to keep it on dirt as much as possible. These bypasses are nice to have, however I’ll take a 2% grade and trailblazing any day of the week! We continued on the county road until we hit the center of Ben Franklin. We knew the trail ahead was going to be the most difficult, but what we found was even worse than it was on the 2013 NETT ride. One year ago, we all remember the bad ice storm that cancelled the 2013 Dallas marathon and covered a thick blanket of ice over the entire North Texas area. That storm caused millions of dollars in damage, and did a number on the trees along the NETT. 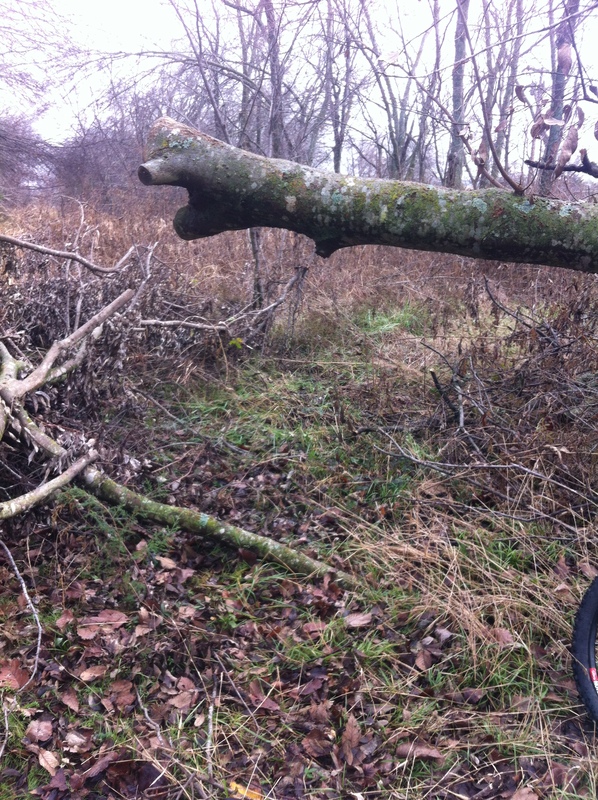 We encountered so many downed trees, we lost count. Here’s a couple of videos of the impasses on this section between Ben Franklin and the Sulfur River. The gap seems pedestrian compared to what we encountered when we came to the bridge. It had completely fallen into the river! Very, very unfortunate for NETT advocates. So do Bearded Women turn back in the face of adversity? Uh, no, especially because we were NOT going to head back and face another lashing from all of the growth we just barreled through! We decide to choose 1 of 3 options, ride across the fields to the nearby county road, probably a good 3-4 mile bypass, ride the river basin, or find a reasonable place to climb up the east side. The first two options didn’t appeal to us because riding in a farm field is hard work as well as in the basin. Recent rains would make the journey even tougher. We were already tired from just getting to the bridge, so climbing up the other side seemed the quickest and easiest of options. We ended up riding down a really fun ATV cut track to the basin before having to stop and almost slide the last 10 feet of mud to the very bottom. We did investigate to see if the tressel would be a possible crossing point, but quickly discovered with muddy shoes and our gear it would be very danger to walk and not fall and break an ankle. Also, due to the tweerk of the east side of the bridge, we wouldn’t have a flat surface to walk on. The unexpected became the highlight of this amazing journey we took for the second time. It’s further ignited a desire to return in a few more weeks to do more trail work and ride into Paris and beyond like we had planned. If the NETT has taught us anything, is that it’s worth the blood, sweat and lashings we took to get to Roxton. Until next time…. Here’s a wrap up of a recent event called Ride the NETT 4 of our team members on Saturday, November 2nd. Two of them raced the DORBA race the following day and the other two completed the ride back for a total round trip of 130 miles! I love rail corridors that are no longer in service, have been rail banked, or abandoned for private purchase. They have layers of history that end up over lapping with new ones when rail trails are developed, like a palimpsest does. They provide a glimpse into our past when this form of transportation dominated our country’s landscapes, our industries, and was the most often used form of transportation. In our area of the nation’s prairie land, we have a fair share of these rail corridors. However, one in particular is special and provides a unique adventure unlike no other can in North Texas.